1. 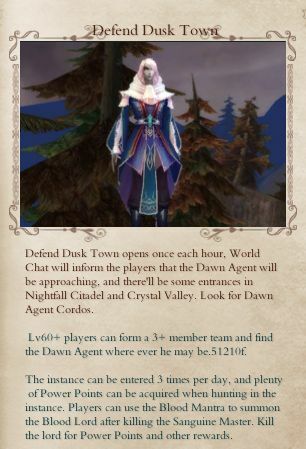 Dusk Envoys spawn randomly at various locations within Crystal Valley or Aepelio. I've seen them everywhere all over the place (one was even floating in air). 2. They spawn once every hour but randomly within that hour (there's no set time for them to spawn). 3. It is announced on World Chat when they spawn. 4. They will leave 20 minutes after they spawn so you better hurry and get your party to them. 5. There will be a World Chat message after they've left. The instance itself is pretty simple, quick, and very familiar and will either be an instanced version one of two areas in the Kindred starting area: Mount Wolvenbite and Dusktown. You'll want some AoEers (Area-of-Effect damage dealers) as large sets of mobs will spawn and it's fastest to have one party member gather them up while the rest kill them. After four sets of different mobs, the boss of the instance, the Sanguine Master will spawn. It's a quick and simple tank-and-spank to kill the boss. The mobs and bosses grant a good amount of soul power when killed. Once the boss is dead, each party member can use a Blood Mantra to summon an additional boss which will drops loot when killed. Be careful not to summon the additional bosses all at once as they each have an AoE and an AoE stun that lasts for a good duration. Your healer might find it hard to be able to keep the party up when he/she is stunlocked by chain AoE stuns. Blood Mantras are random drops from mobs in Aepelio. They can be combined in Nightfall at the cost of 10 Mantras to recieve a Mantra of one level higher rarity. The rarer Mantras grant better rewards (such as higher level runes and reforging shards) than the common ones. That being said, you better make sure each party member is rolling only on the loots dropped by their own summoned boss before you go using your purple Mantra.